Running for president in 2020 is grueling. You need to raise tens of millions of dollars (at least), crisscross the country for months, and be omnipresent in earned media, paid media and social media. And in a field of 18 candidates (and counting) – you still have less than a five percent chance of winning the nomination. So why are so many people choosing to throw their name into the ring? We break down the benefits of running for president – even for the candidates least likely to win. And scroll to the end to see how Trump’s campaign is already reaching out to communities of color in critical swing states – 19 months ahead of the 2020 election. Donald Trump’s online investment dipped below $200K this week, but he’s still spent over $6.38 million since the midterms. 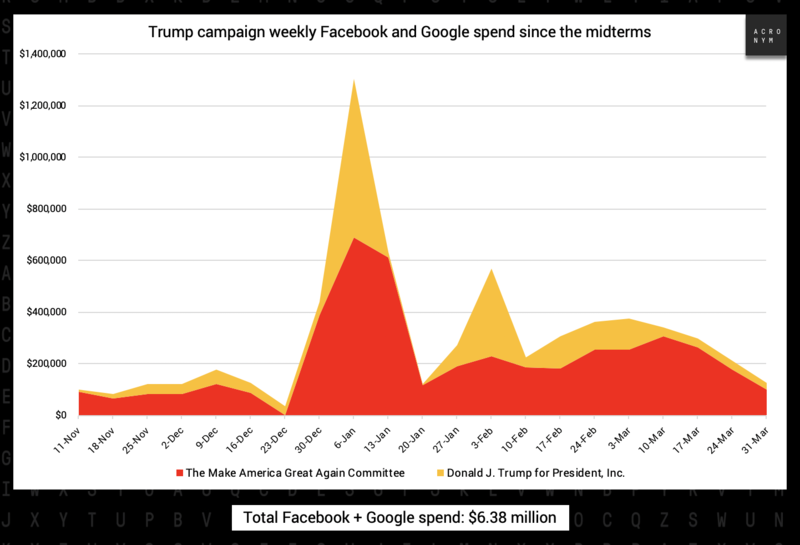 Trump was outspent by Andrew Yang and Amy Klobuchar – and keep in mind that last week’s spending reports include March 31st, the last day of the fundraising quarter. On the Democratic side, Bernie still leads the field in total digital investment since the launch of his campaign. He’s just shy of spending a million dollars – as of April 6th he had spent $999,221. 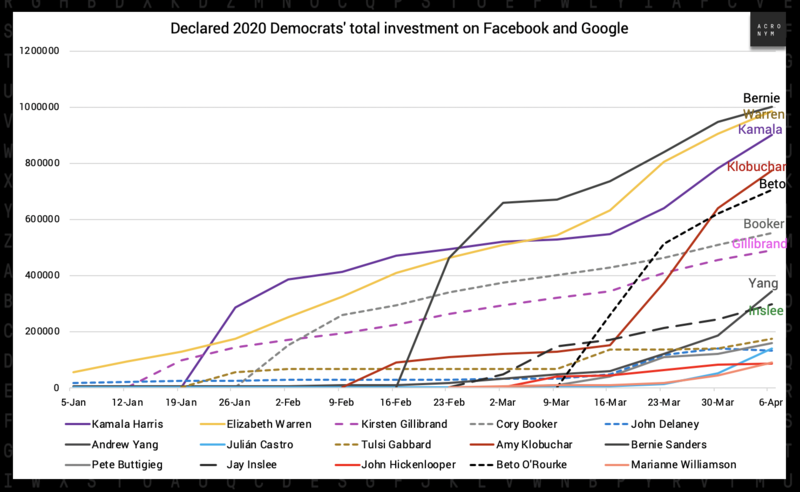 He’s closely followed by Warren ($984,276 investment on Facebook and Google) and Harris ($900,552). 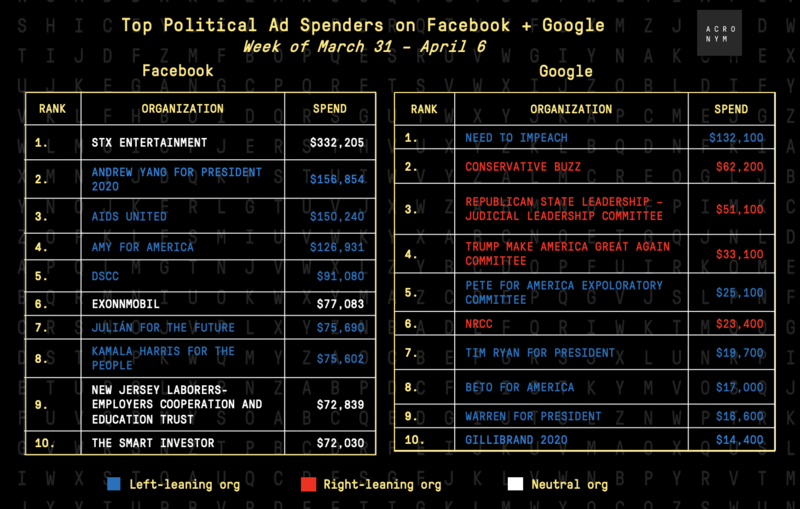 Here are the top Facebook and Google spenders from March 31 – April 6. Unsurprisingly, Democrats dominate the Facebook top spenders list as they likely were making a final push on March 31st to fundraise before the end of quarter deadline. Regardless of where the candidates fall in terms of popularity, launching a presidential bid automatically puts you on the same stage as all the other candidates running for president – if you can recruit grassroots support early. 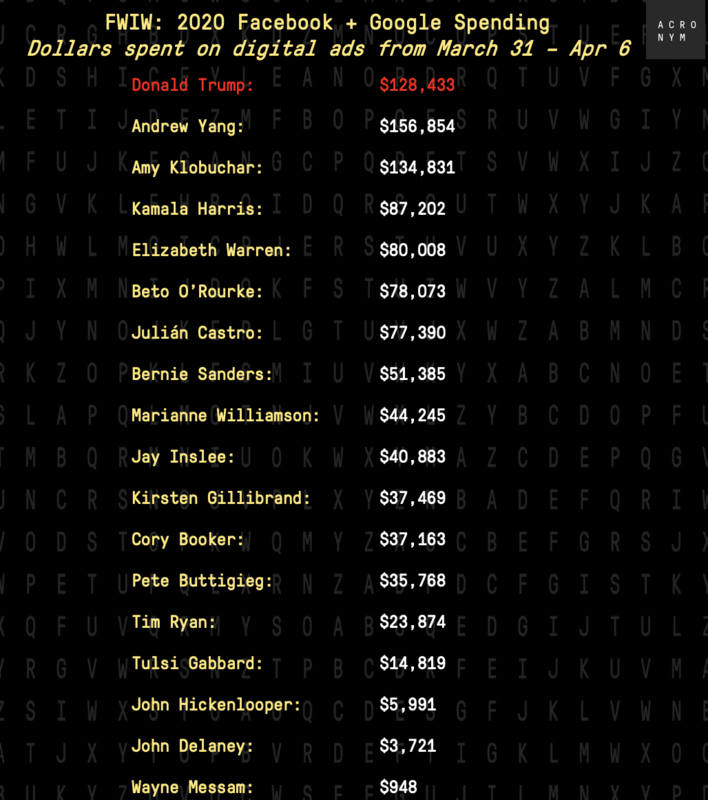 Just look at little-known candidate Andrew Yang who smartly leveraged social media and digital advertising to reach the 65,000 donor threshold to make the Democratic debate stage. Come debate time, he will have a trance to introduce himself to millions more Americans, regardless of the fate of his bid. Closely linked to building a national profile, running for president can be a useful strategy to prepare a candidate to seek a higher office than they’re in now (if they’ve served at all). 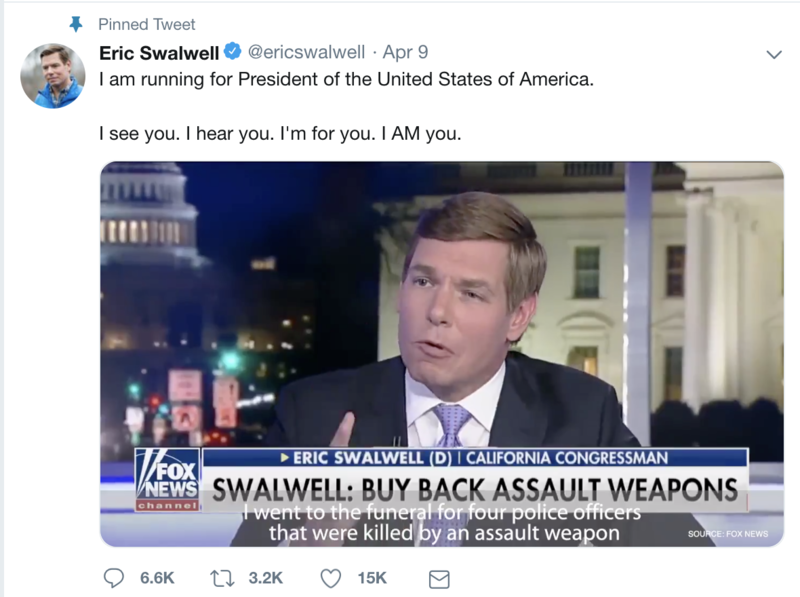 Candidates like Eric Swalwell or Tim Ryan can use a national bid to build their list and test whether messages they’re driving can break through with statewide or national audiences, and leverage those lists if they decide to run statewide or nationally in the future (not to say we don’t think they’ll win, but ¯\_(ツ)_/¯). While related to list-building and raising your national name ID, candidates can leverage a presidential bid to raise money for future elections simultaneously. Take Amy Klobuchar, for example. Earlier this week, her campaign announced that it had raised $5.2 million in Q1 – but what you may have overlooked is that some of that money is specifically designated to be used in the general election (her campaign has not disclosed the exact amount). Yes, that means the presidential general election, but it also means that if Klobuchar does not win the primary, she can use that money for a future federal general election. More specifically, if she ends up running for Senate again, she can transfer the money she raised for the presidential general election into a future Senate general election bid. It’s important to note, however, that these transfers can only happen for candidates that run for federal offices. So a candidate who decides to run for a governorship or other statewide office could not transfer money raised through a presidential bid. In a crowded field, candidates who break through and build engaged, committed supporters are more likely to be considered as Vice Presidential contenders or members of the cabinet. Perhaps that’s why you’re seeing some candidates like Jay Inslee running single-issue campaigns. If you can own the lane around specific policy areas – like education or environmental protection or health care – you might be the most likely person to run that part of a future president’s administration. Just take the 2008 race- Barack Obama chose primary rival Joe Biden as his running mate, appointed Hillary Clinton as Secretary of State, and nominated Bill Richardson (who also ran for the Democratic nomination in 2008) to serve as Commerce Secretary, though Richardson later withdrew his name. Candidates running single-issue campaigns may have goals beyond their own roles in the cabinet, the White House or elsewhere. 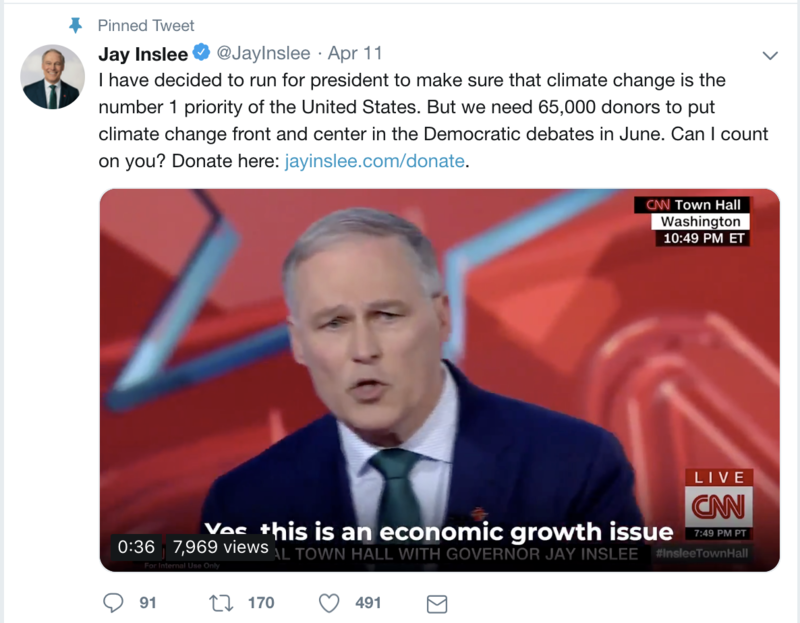 Candidates like Swalwell, who is making his campaign centrally focused on curbing gun violence, or Inslee who is talking about climate change and protecting the environment, may be using the 2020 platform to increase pressure for broader policy changes or action around these issues. When you’re guaranteed a CNN town hall, earned media attention, and if you can make it onto the presidential debate stage, using those opportunities to drive awareness about specific issues rathercan help put pressure on legislators to prioritize those policies…if that message resonates with enough voters. 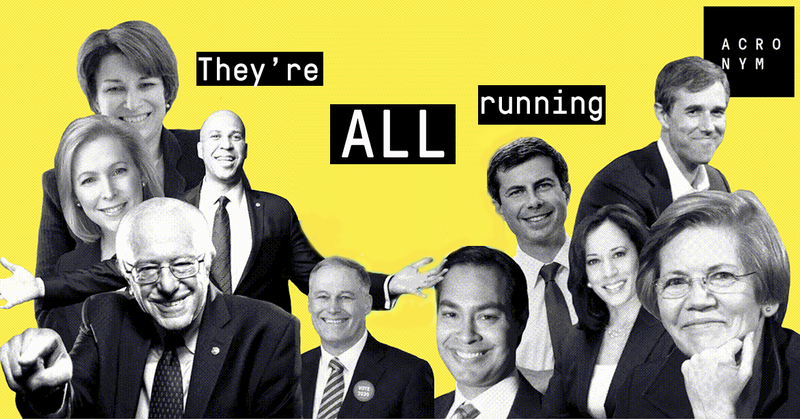 There’s no question that running for president is grueling, raising money to keep a campaign up and running for over a year is a challenge, and breaking through in a field of 18 (or more) is even harder. But there are some benefits that come along with launching a bid for the highest office – even if you don’t make it that far. Trump’s campaign is still running thousands of ads online about the border wall, they’re still offering potential donors “membership cards” and they’re still running generic ads featuring Melania Trump. 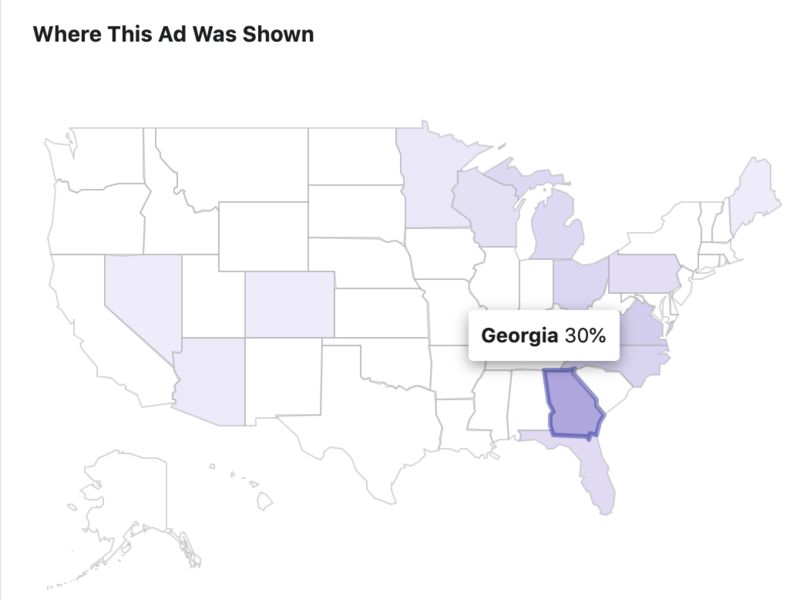 But this week, we noticed some new ads the Trump campaign is running online to drive strategic narratives in critical 2020 battleground states. 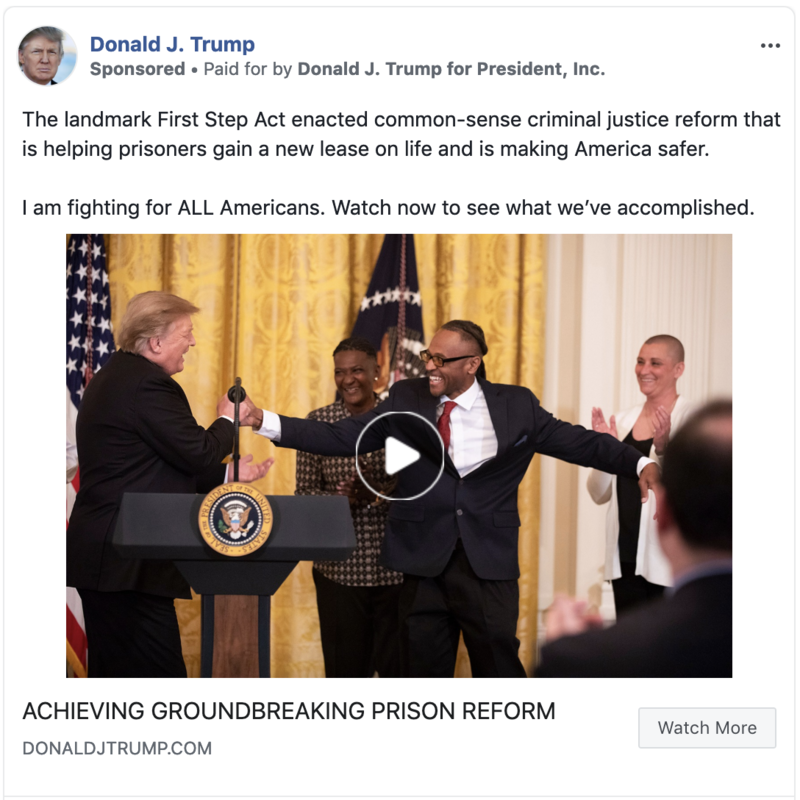 Earlier this week, Trump’s campaign started running dozens of ads primarily targeting voters in Georgia, Florida, North Carolina, Virginia and Ohio touting the First Step Act – the criminal justice reform bill Trump recently signed. The ads are promoting a 3-minute video featuring Jared Kushner, news clips of Alice Johnson and mentions of Kim Kardashian – likely in an effort to try to court communities of color in battleground states. This approach is in line with the Trump campaign’s overall messaging strategy – to make voters believe Trump has kept his campaign promises in the White House even if he hasn’t. We’ve been saying for months that Democrats need to start driving counter and offensive messaging – and at ACRONYM, we’ve been working on a plan to do this. Email us if you’re interested in learning more. In case you’ve been living under a rock, Game of Thrones’ final season starts this week, and the Game of Elections will soon follow. Starting next week, we’ll be launching 2020-themed trivia in the days following each new Game of Thrones episode, where you can pick which candidate you think is winning the battle for the Washington throne each week and enter to win sweet swag. Sign up at gameofelections.com, invite your friends and get ready to play. 2020 is coming. Don’t get left out in the cold. That’s all for this week. But before you go, we want to make one ask of you – if you love FWIW, forward this email to three friends. They can sign up for weekly updates at www.anotheracronym.org/fwiw, follow us on Twitter and email us with ideas of what we should dive into next. P.S. You can find today’s issue of FWIW here and read this week’s edition of FWIW Virginia at this link.